Mix first 5 ingredients with a fork. Add shortening and mix until shortening is broken up. Set aside. In another bowl combine eggs, milk and diced apples. Add to dry ingredients just until blended. Spoon into greased muffin pans. 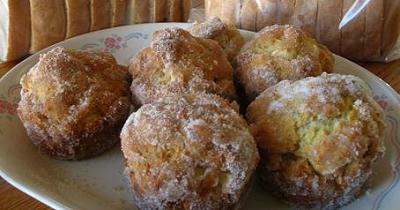 Bake at 350 degrees for 20-25 minutes or until muffins are light to medium brown. While donuts are baking, melt 1/2 cup butter. Set aside. Combine 1 cup sugar and 1 teaspoon cinnamon. When donuts are done and before they have had a chance to cool, dip in butter and then in sugar. You can find more fun and affordable recipes in my cookbook Family Feasts for $75 a Week . Check out the reviews on amazon to see what others are saying about the book. I may need to raid my MIL’s apple trees this one sounds GOOD! (even to my non-baking skilled brain). Mary, I really enjoy your blog and i always amazes me that every time I look, You’ve posted something new. Even Now, at 12:30 at night, I find you’ve posted something from when I looked earlier. Thanks for writing. Wow! These look delicious. I love your blog in all it’s enthusiasm and life with your 10 children. Those look soo good, now you’ve inspired me to get up and cook muffins. My mother went apple picking over the weekend so I definately need to do something with all those apples. Oh my. I can not wait to try this! Hi Mary, I just found your blog through one of the “5 minutes” sites…I like to read the mom’s and parenting ones:) I am truly happy that I found you…and I am soooo revved up to try your recipes; I am on a “feel good” and healing journey in my life and seem to be searching for all the goodness I can find. Thank you for sharing some of your blessings with me. Life can be trying, and it is nice to have pick-me-ups when you’re feeling blah:) Take care, and I’ll let you know how the apple donuts come out…wish me luck!!! Thanks you so much for sharing. I can not wait to try them. I don’t know how you do it with such a small grocery budget. I spend $200 a week for four people! Not much junk food- but probably too many “conveniance” snacks. I need to do better. Fantastic recipe! I’ll definately have to try it out on my two-year-old niece next time I have a chance to cook. Those look delicious. I am soooo stealing that recipe! Thanks for sharing! I so want to make these. Could they use a touch of vanilla? I’m working all this week, then going out of town for a church Women’s Retreat, so I printed out the recipe for next chance at the oven. When I bake them, I’m going to substitute a cup of quick oats for the flour. Something about apples and oats that I like together. The dip in sugar/cinnamon is a nice touch. PS- do you recommend a particular apple? I figure something “tart” like braeburn or granny smith…? Thanks! Mary, I’m a little late in commenting here, but I wanted you to know that we made these muffins yesterday and they were absolutely extraordinary! As a perpetual dieter, I tweaked the recipe just a bit (mostly so I could justify eating one . . . or maybe two!) I used one cup of whole wheat flour and two cups white; I used 1/2 cup applesauce and 1/4 cup shortening (instead of all shortening), and I brushed the muffins with butter instead of dipping them entirely. I’m sure your Mom’s original recipe is just that much more spectacular, but mine turned out pretty darn good (if I do say so myself) – – – and now the whole house smells like autumn. I just sampled one of these 15 minutes removed from the oven and they are absolutely amazing! Thanks for the recipe! Just made these today. I didn’t have any apples so I used pears. Absolutely yummy as well. And I didn’t both chopping them, I just grated them with my cheese grater, peel and all! I was hoping to keep half out for breakfast this week and put half into the freezer but we already ate four of them so there will be a few less in the freezer! Totally yummy though.